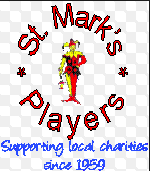 Long term South Norwood favourites, St Mark’s Players have another pantomime favourite coming up. Not at Stanley Halls this time, but they will be back. SMP’s Chairman and Music Director, Chris Smith-Gillard explains further………..
After more than 50 years of performing at The Stanley Halls in South Norwood, St. Mark’s Players will perform our 2014 family pantomime ‘Snow White’ at The Beckenham Public Hall. It’s quite a feat, however, which the Stanley People’s Initiative have taken on. They are doing the most fantastic job and I have every confidence that the finished product will be once again the ‘jewel in the crown of Croydon Entertainment’. We, at St. Mark’s Players, wish the SPI all the luck and encouragement which they deserve to open the halls for all to use. Meanwhile, we shall perform our own magic in Beckenham Public Hall where we have had to put on an extra performance as tickets are selling fast and the second matinee performance is already sold out. Written and directed by Emma Gray of St. Mark’s Players, this is a family pantomime for all which tells the traditional fairytale – but with some modern twists along the way. Who’d have thought Snow White’s friends would be running a B&B in Appletonia or that modern day technology may save them from disaster! Come and boo the evil Queen, her cunning aide, Robb U. Blind and her nit-wit henchmen Bangers & Mash – will they kill Snow White or can you help the handsome Prince to save her. Fun, jokes and slapstick weave their way through the whole adventure; combine this with songs from Disney through to rock and the ever-popular audience participation and a great time will be had by all. Oh, yes it will! As always, St. Mark’s are supporting local charities and this year’s chosen charities are Croydon Carers and St. Christopher’s Hospice. Adult £9 Child £7.50 Group Discounts. Licensed Bar. Refreshments. Disabled Facilities. In terms of blogs, you will be forgiven for thinking that The Lives of Stanley Halls project has been a tad quiet of late. Far from it! Over the last few weeks volunteers and project staff have been busier than ever. Drawing on the copious amount of research and oral history interviews that have been carried out of late by our project volunteers, the exhibition has had to be written, edited and images had to be selected and, in the meantime, volunteers continued their research and conducting interviews. The final exhibition, The Lives of Stanley Halls: Theatricals, Community and Entertainment which will be revealed on Wednesday, 4th December (6.30 pm), is bold, vibrant and celebrates the history and heritage of Stanley Halls and the community’s enjoyment of it since its opening in 1903. During the project we have learned so much about the variety of ways that the Halls have been used, such as the opening ceremony in 1903, meetings of suffragettes in 1912 and pantomimes and performances. Some uses have been quite surprising such as aquarist exhibitions, psychic festivals, shoe sales, dog shows and baby welfare clinics. But what all these various events and activities demonstrate is how central Stanley Halls has been to life in, and reflective of, the interests of the South Norwood community. 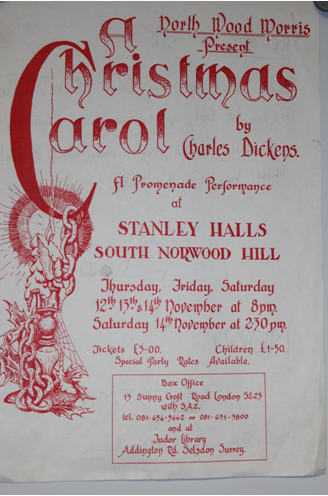 A poster advertising The North Wood Morris performance of A Christmas Carol which was remembered fondly by one of our interviewees, Susan Abigail. 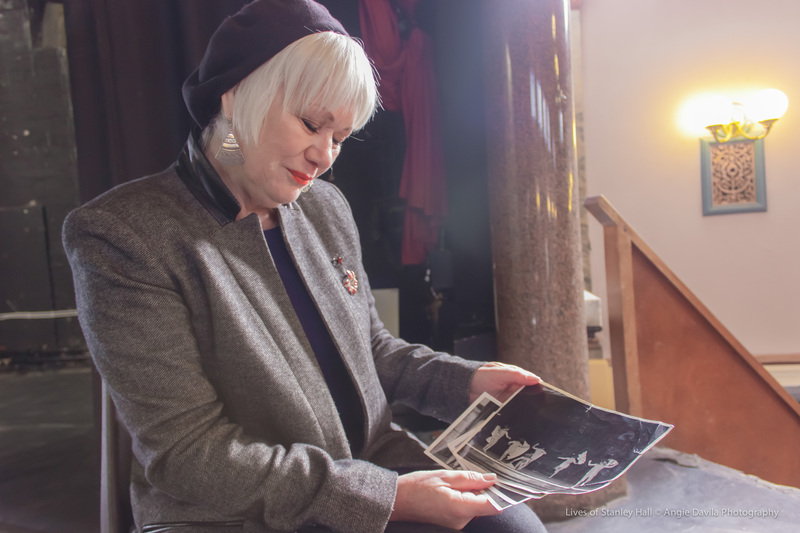 Read more about her experience (and the experiences of many others) in the exhibition The Lives of Stanley Halls: Theatricals, Community and Entertainment. At a loose end this weekend? Fancy feeling all virtuous because you have done something that makes a difference? Come and help us clean up Stanley Halls this weekend. If you can spare a few hours, come and help clean the Halls. Everything: mopping, dusting, polishing, washing. You name it, we need to clean it. There is also the urgent need to emulsion the gents toilets and, for those that can, move a bit of furniture. We’ll be there, between 10.30am and 4.30pm on Saturday 23rd November and then again on Sunday from 11am to 3pm. 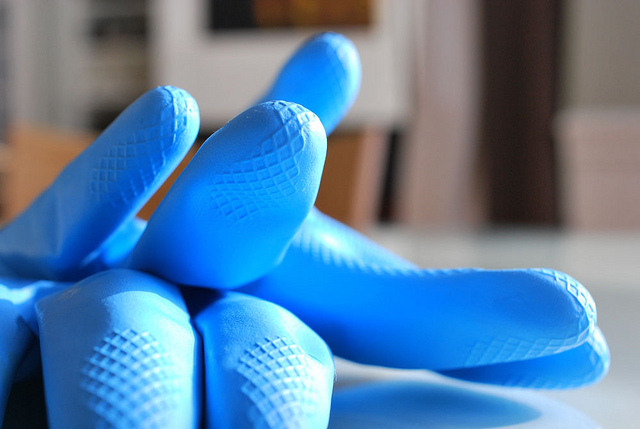 All we ask is that you bring your rubber gloves and old clothes. We’ll have some refreshments. You never know, you might even enjoy it. It would be a great help if you could RSVP to info@stanleyhalls.org.uk if you can make it. Thanks from the SPI board. Stanley Halls is not all about greasepaint and lights; it is a place of enterprise. Could it be the place you site your business? To kick-start our focus on bringing enterprises into the Halls, Croydon Council will bring it’s Introduction to Social Enterprise course to the Halls on 21st November as part of Croydon Business Month. Croydon Council brings the event ‘An Introduction to Social Enterprise’ to Croydon. Have you got a business idea that is focussed on supporting your local community? This introduction to social enterprises will outline the fundamental principles behind social enterprises that can bring people and communities together for economic development and social gain. The workshop will look at social enterprise sectors, potential legal structures and the three common characteristics of being enterprise oriented the social aims and ownership structures of the sector. The workshop will also hear about the new toolkit that is being developed to assist social enterprises in Croydon. In the week when we just happen to have had our first fire survey of Stanley Halls, John Nalty’s reminiscence makes a few members of our board feel a bit uneasy………. The more recent memories I have of Stanley Halls are from a decade ago when taking the kids to the annual pantomimes but as I sat in my seat listening to the screams of excited children my mind always drifted back to almost 40 years previous when I, too, trod the boards at Stanley. 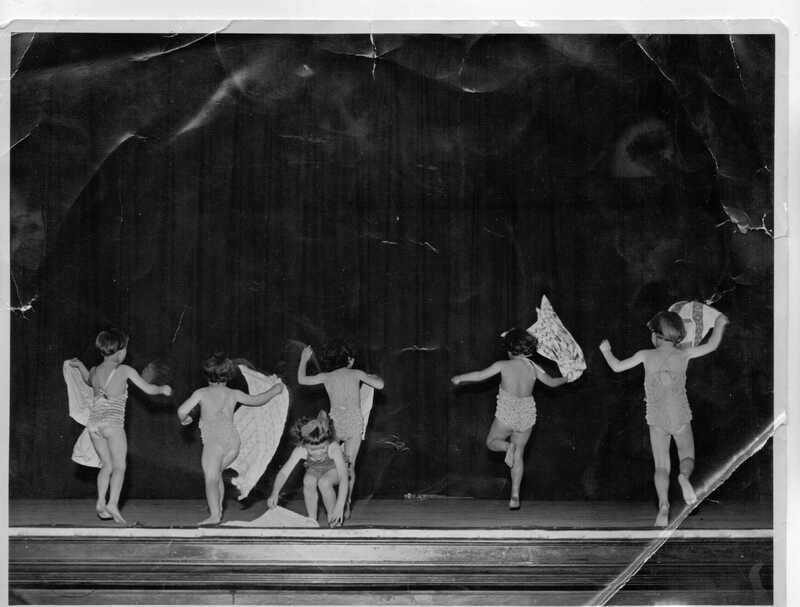 It was a once-only Scouts Gang show (well twice really as there were two performances) around 1965/6; we had been rehearsing in the technical college next door for several weeks and the whole performance was to be put together for a Friday and Saturday showing to packed houses. The excitement was building up, butterflies in the tummy, stage fright, the lot as our Scout leader, who we called Skip, collected each of us from home (to make sure we turned up) – not in an elaborate limo or even a minibus but a motor bike and side car. How he managed to get seven scouts in it, I will never know (and it would clearly not be allowed these days). Arriving at the Hall we were taken into the make-up area (oh yes, very professional and we had to hide our spots), then there was the wait for our performance plus a few bits when we were added to other acts just as extras. The show started with a senior scout leader coming on stage to welcome a few ‘dignitaries’ and tell a few jokes. To make sure he got the correct response we were all back stage reacting to prompt boards of ‘Applause’ and ‘Laugh’, and this was followed by a few songs and sketches. Then I was on stage, just as a makeweight in a sketch about bob-a-Job week, each scout telling of his experiences, one lad said that a woman invited him in because it was raining and he was asked to hold her baby. He then said with a grim face ‘I might as well have stayed out in the rain’ and a greeting of groans and laughter followed. Next up was a short walk-on bit featuring one of the few females involved, this woman was complaining about her car, it had broken down and when she lifted the bonnet she discovered that the engine was missing, several questions were asked but finally, and to hoots of laughter from the audience – she said her car was a Volks Wagon Beetle! – and we were on next. The second half was similar to the first, with various sketches and songs. I remember one which featured men singing about the train they used to travel to work in and how they no longer spoke to each other since it was axed by cutbacks (yes even in those days); each held a newspaper and dressed in a fashion of the stereotype who may read a particular paper, such as the Times, the Telegraph, the Guardian, the Mail, the Express, the Sketch and the Sun and they sang accordingly. It was a bit ‘classist’ and not PC by today’s standards. Then the grand finale, everyone on stage around the camp fire, which was a prop made of twigs in a wigwam shape with bits of red and yellow tissue paper stuffed in it and a large light bulb in the centre. We sang a few traditional camping songs and finished with everyone standing for ‘God save the Queen’. By now the camp fire was noticeably smoking – a nice effect from the props department I thought! But no, at the end of the national anthem it burst into flames (the light bulb was too hot); it wasn’t used for the second performance. At the end of the evening, it was orange squash and cakes in the side hall then back home with my mum, dad and sister on the 196 (Skip didn’t have room in his side car for all of us). Stanley Halls – thanks for the memory. Phillippa Heath, The Lives of Stanley Halls Project Coordinator introduces us to Jane Nicholl’s first steps on to the stage. On Saturday, 12th October, Stanley Halls opened its doors to the residents of South Norwood for a Stanley Lives Open Day and attracted over 60 visitors who toured the building and reminisced over tea and cake about their memories of visiting Stanley Halls. All of these recollections will form the basis of The Lives of Stanley Halls exhibition which will be on display in the Halls from December 4th and then tour around community venues in the new year. But, to whet your appetite, here are the type of fascinating recollections that you can expect to discover. Meet Jane Nicholl, who first visited the Halls in 1953 at the tender age of two and a half years old, and recalls these early memories with project volunteers, Anne, Sharon and Jan, and SPI trustee Andrew Nelson. Jane Nicholl remembering the first time she was on the Concert Hall stage. Were you aware of people watching you? “Yes but for some reason I wasn’t daunted by it. I felt quite separated because the stage lights were on so I think at the time you felt separated from the audience and it didn’t feel quite real, it was like I was looking out at them rather than them sitting looking at you”. “The music was played on the piano by a woman – it always seems to be women who played in those days – this who had an enormous bosom. It was always plump women with enormous bosoms playing away on the piano….! And funnily enough my Dad had a piano business in Crystal Palace and he supplied the piano”. “Stanley Halls was one of those places that I can always remember….. it’s always been there, it’s always been a landmark. Over the years it got into more of a state of decay but it’s always been there for performances, it’s a landmark, everybody knows it”. In his usual inimitable style, Khris Raistrick looks towards the budding talent of South Norwood, while perhaps highlighting his own tribulations with everyday life………. ‘This is sick!’ said one exuberant girl as she charged alongside her friends into Stanley Halls with the energy of someone desperate to get to the front row of a Rihanna concert. There was a chorus of ‘wow’ as they looked around the Halls. About 30 seconds earlier I had been inwardly scowling at them, or more precisely one of them, who was standing on the wall and sort of leaning on the noticeboard – pristinely painted of course – where Judith and I were putting up the sh! posters [here is an example, you’ll have to look outside the Halls to see the full range] ahead of last Saturday’s Open Day. Or rather, Judith was prising the doors open as carefully as possible – since the, er, pristine paint was making it tricky to get into the cabinets – and doing battle with the unlabelled keys in the unmodernised locks while I was following with the drawing pins. Anyway, back to Stanley. One of said girls had suddenly turned to me and asked if they could go in. On whose authority, I have no idea – but two years of SPI committee meetings must grant you certain privileges – I puffed out my chest and said ‘if you’re quick’. Imagine if they’d decided to play hide and seek in that place. You might have to spend hours looking for them. My curmudgeonliness soon melted, however, seeing the genuine awe and enthusiasm from these girls. And then…. ‘Can we go on stage, please?’ Oh no. The stage…the orchestra pit…the steps. THE INSURANCE!!!! Still, in for a penny, in for a pound. ‘Go on, then, but please, quickly.’ And then, the most beautiful moment. Five girls, full of joy, singing, a capella, Amazing Grace. Beautiful. I could have sworn a beam of sunshine came through and shone on them at just that moment, but I might be making that bit up. And then, as quickly as they were on, they were gone. That 196 bus wasn’t going to catch itself. ‘Thanks’ they beamed as they skipped out. ‘I expect to see you on that stage again when this place opens,’ I replied. If that is an omen about the things to come at Stanley Halls, could you have a better one? FOOTNOTE: ‘Sick’, M’lud, is a term used by young persons and means ‘great’ or similar. It is not one of the banned words that Harris Academy has listed, such as ‘bare’, meaning ‘very’, and the ubiquitous ‘innit’. If those girls had said ‘bare sick’ their feet wouldn’t have touched the ground, let me tell you. And yes, I know it’s the Upper Norwood students who have been censored, not our very own next door neighbours, but don’t let that spoil the story. Innit? The saga of the toilet door and the dad in the bikini! As the Open Day draws near – Saturday, 10 until 4, free cake and stuff – a very interesting communication rattles by the SPI Communications hub. At the end of this fascinating piece from Alison Morgan – don’t cheat and skip to the end! – are some interesting and perfectly understandable concerns. Carol Clapperton, our woman in charge of the ladies’ toilets – we said don’t cheat and skip to the end!! – will address them. My name is Alison Morgan and I am afraid I cannot be present on Saturday but I have masses of memories of the Stanley Halls. It was in my blood as my mum and her parents lived at 92, South Norwood Hill and my mum had her 21st birthday party there. My first introduction was as a child, being taken to the downstairs assembly room for a clinic for children where we were given free orange juice and cod liver oil and babies were weighed. It was just like Call the Midwife. 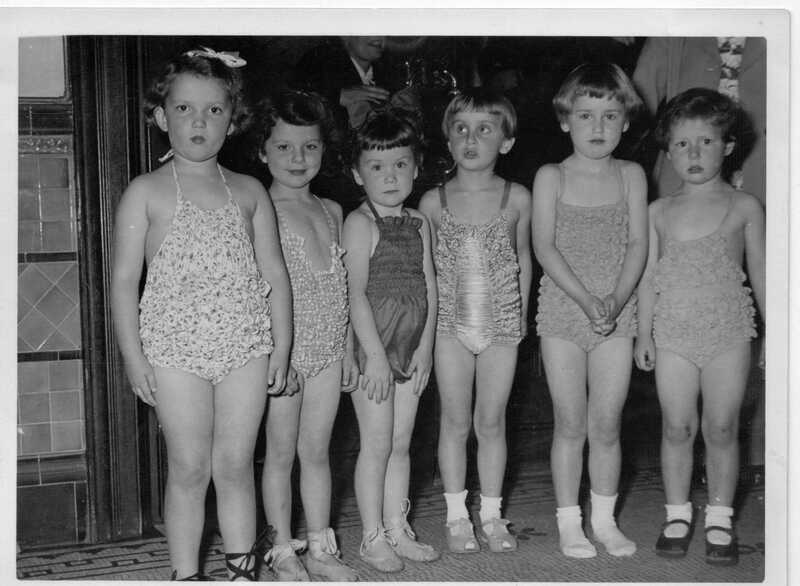 Then I got taken when I was four or five to my first ballet class on a Saturday morning in the upstairs assembly room – the ballet school was there for many years and we had shows in the main Hall. I also remember my grandma performing there with the Townswomen’s guild in a review. But my abiding love for the Halls is based on St Marks’ pantomime. My father was one of the original members. There is a good little book out on the players with loads of photos of the Halls) and it was held in one or two venues before going to Stanley Halls, where it recently celebrated 50 years of St Marks’ panto. It was a really big undertaking and local children got really excited about the panto coming. It was held over three weekends starting about the 2ndor 3rd week in January. The Hall was all decked out and we sold refreshments and sweets. The standard was superb as we always had excellent live musicians. Some of the knockabout scenes, which always descended into a race round the audience, were legendary. Children were invited to go on the stage for the final song with sometimes 50 people on there. We packed in the all the Cubs and Brownies in the matinees. We also had fantastic animals that were made from scratch – the cow, the goose. These were all made by my friend Sheila’s dad Jim Clements. They were so good that he was invited onto Blue Peter twice to show them off (also in the book). They are still being loaned to professional companies today . I played some parts but gradually drifted away to university. But I came back later and did a lot of front of house – which is why I am so passionate about the back of the ladies’ toilet door, the sign saying ‘Ladies look after your handbags’. Have a look to see what I mean again about location work. Even if the toilets have to be updated – keep the door somewhere. In my various roles I have been all over the building – the dressing rooms and other rooms underground, and the back passage. (NB that should be covered again in case the cast wish to enter from the back of the hall. Not much fun in the pouring rain.) I remember the scenery dock , the hooks at the back to load heavy objects in, the link between backstage and the upstairs assembly room, the flats downstairs. I could go on – as I said the only problem is that I am so attached to the building the idea of any modernisation leaves me with a very heavy heart because to me it is perfect. One of the reasons I am very opposed to any modernisation of the Halls is partly sentimentality on my part but also because I think we should be able to hire it out a lot for locations (the main Hall as well). An awful lot of drama now in both films and TV is set in the past and venues like this are gold dust. Carol’s note: The signs and original features will all be retained. Necessary works been carried out by Croydon Council, particularly regarding the electrical system, and other necessary 21st Century unobtrusive features have been added. But, have no fear, the intention is to renovate, not reinvent! Sure this wasn’t written yesterday? Proving that things never really change, historian and The Lives of Stanley Halls project leader Phillippa Heath reminds us that the values of the ’60s are still relevant today……. “Without question the (Stanley) Halls fulfil an important social need in the area by providing local organisations with a place to meet and discuss and organise their activities. And this, of course, stimulates a sense of community and an interest in the area and its problems. A live and active community centre is certain to result in more vigorous local organisations and consequently more interest in local government”. You will be forgiven for thinking that these words were written recently but, in fact, they were recorded nearly 50 years ago. The Lives of Stanley Halls project is now very much underway and our team of dedicated volunteers is busily researching in archives and starting to conduct oral history interviews. As we embark on bringing the Stanley Halls’ history back to life through the project, among the articles that we have unearthed is this stirring piece in the Croydon Advertiser, November 5th, 1965, which talks about the Halls’ great successes and its hope that Stanley Halls will continue to be central to community life long in the future. “The Stanley Halls in South Norwood Hill puts the lie to the theory that television has virtually destroyed any demand for community centres. For not only are the halls still flourishing after 62 years of life, but their popularity among the local social groups is increasing rapidly. In the past five years the number of bookings at the halls has nearly doubled from about 900 to almost 1600. No doubt a great deal of the credit for the rising popularity of the concert hall goes to Mr James Smith, the manager of the Stanley Halls since July 1960. The son of a West End stage director and himself a cinema manager for 20 years, Mr Smith has worked hard to make the concert hall increasingly attractive to local amateur groups. 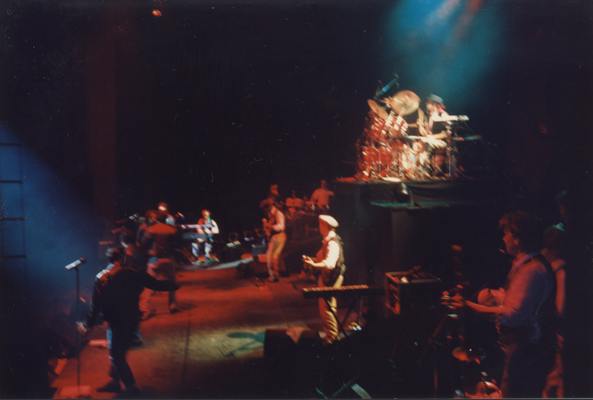 He has installed new stage lights, re-dressed the stage and put tip-up seats in the balcony. At almost any time, on any day of the week except Sunday, something will be going on at the halls, in either one of the two spacious assembly and rehearsal rooms, the committee room, the concert hall or the art gallery. It might be an old-time dancing session organised by a Townswomen’s Guild in one of the assembly rooms, or a rehearsal for a play, or a lecture, or a flower show, or a bazaar. Dog shows, church bazaars, infant welfare clinics, dancing classes, union meetings, political rallies, dances, orchestral concerts, bingo, dog-obedience classes and a score of other events are all held at the Stanley Halls. Without question the halls fulfil an important social need in the area by providing local organisations with a place to meet and discuss and organise their activities. And this, of course, stimulates a sense of community and an interest in the area and its problems. A live and active community centre is certain to result in more vigorous local organisations and consequently more interest in local government. Join Phillippa and project volunteers on 12th October for tea, cake and to remember times in Stanley Halls. What events do you remember attending at the Stanley Halls? Did you attend a dancing class? A dog show? A bazaar? Infant welfare clinics? Thanks for your comment. Don't forget you can join the Friends of SPI and we'll keep you in touch with developments at Stanley Halls. Just tick here.